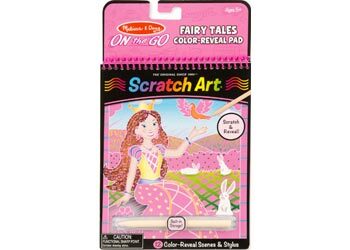 All-inclusive and self-storing, this compact color-reveal Scratch Art book brings the fun anywhere kids may go. With the included wooden stylus, children can etch within the lines to reveal 12 fairy tale scenes featuring princesses, mermaidsand fairies; by adding patterns and details, they can make each picture uniquely their own! Each set comes with built-in storage for the included stylus.